In Stans, climb aboard the vintage funicular railway dating back to 1893. Travel at a leisurely pace through level terrain, fields and woodland to Kälti – just a short distance away. 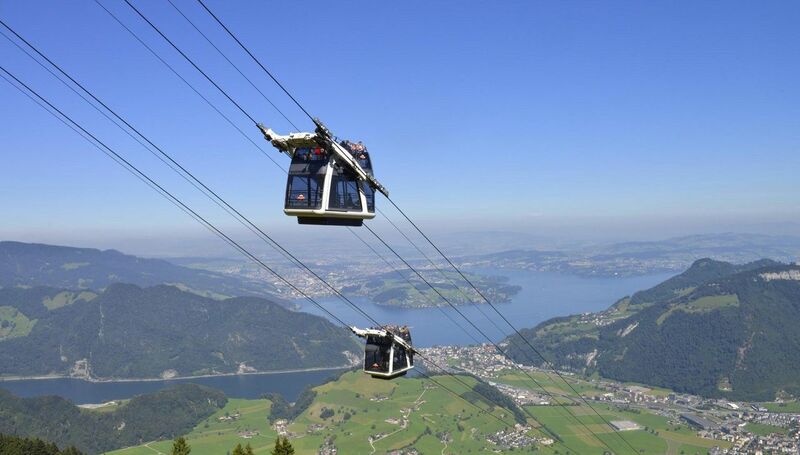 Here is where you change to the ultra-modern CabriO – the world first double-decker aerial cableway with open upper deck. The double-decker aerial cableway with open upper deck was inaugurated in 2012. The cabins are suspended and pulled by cables that pass either side of them. Meanwhile, the floor area is equipped with stabilisers that counteract any swaying motion – an innovation. Passengers thus feel like they are floating. The «convertible feeling» is experienced on the upper deck as the wind blows through your hair. The cableway trip is not the only thing to look forward to – once you reach 1,900 m, all sorts of possibilities present themselves for kicking back and relaxing. Take in the views of the Alps and ten lakes, or marvel at the fascinating fauna and flora. The Stanserhorn rangers are on hand to help you find the marmots and spot the eagle soaring high above. Visitors in search of a more active escapade have a number of footpaths to choose from. The well-marked trails offer something for everyone – from the 30-minute tour of the summit to the 4-hour hike from Stans up the Stanserhorn. There is also a quick way down: get an adrenaline kick from tandem paragliding or hang gliding.